President Trump speaks at a press conference on Wednesday as the 2018 United Nations General Assembly wraps up in New York. 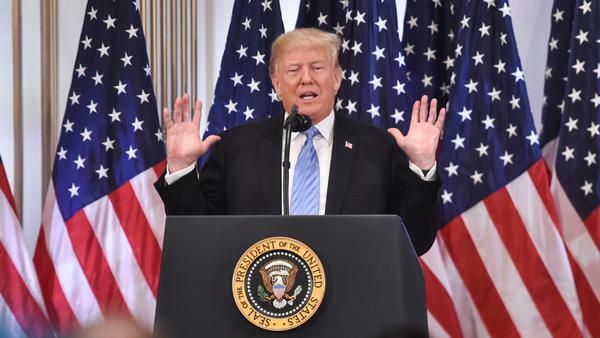 During a rare press conference Wednesday, President Trump sent mixed messages about the fate of his embattled Supreme Court nominee, Judge Brett Kavanaugh. At different points in the rambling, nearly 90-minute event, Trump said that the allegations of sexual misconduct against Kavanaugh were "all false" and that he "could be persuaded" otherwise. One thing was clear: There's a lot riding on Thursday's Senate Judiciary Committee hearing. Trump suggested that he could withdraw the high court nomination if he decides that Dr. Christine Blasey Ford, the first woman to come forward with allegations against the federal appeals court judge, is telling the truth about an alleged incident when she and Kavanaugh were in high school in the 1980s, and Kavanaugh allegedly sexually assaulted her. But the president also vigorously defended Kavanaugh, who's now been directly accused by three women of sexual misconduct — in all three cases the judge has denied the allegations. Trump bemoaned that men can be derailed by and presumed guilty when such allegations surface, saying he sympathized with the jurist because he's also faced similar accusations. At first, during the freewheeling questioning from reporters at the 2018 U.N. General Assembly, Trump painted the accusations against Kavanaugh as purely partisan and faulted Democrats that the allegations had come to the surface in the first place. "[Democrats] are actually con artists, because they know how quality this man is and they've destroyed a man's reputation, and they want to destroy it even more," Trump told journalists in New York. "And they know it's a big, fat con job," he continued. "And they go in to a room, and I guarantee you, they laugh like hell on what they pulled off on you and on the public, they laugh like hell." Trump said the allegations of the three women "are all false to me," bemoaning "what they've done to these children — these beautiful children of [Kavanaugh], and what they've done to his wife." "When I look at what's happened to the reputation of a great gentleman — a great intellect, a brilliant man, somebody that has a chance to be one of our great Supreme Court justices in history — intellectually, I think it's a shame," Trump said. The president said it "wouldn't have mattered" to Democrats "if the FBI came back with the cleanest score" if they had investigated the veracity of the claims of sexual assault and more against Kavanaugh. So far the White House and Republicans on the Senate Judiciary Committee have declined to ask for the FBI to investigate the decades-old allegations against Kavanaugh. At one point, Trump even mused that "didn't George Washington have some allegations against him?" But later in the news conference the president said he planned to be watching when both Kavanaugh and Ford testify on Thursday before the Judiciary Committee and would listen with an open mind. "It's possible I'll hear that and say, 'hey, I'm changing my mind,' " Trump said of the anticipated testimony. And if he believes the accusations against Kavanaugh are ultimately true, he would consider withdrawing the nomination. Trump declined to call the women who have made accusations against Kavanaugh liars, but said he empathizes with the judge given that multiple women came forward with allegations against him during the 2016 presidential campaign. Trump also mischaracterized the accusations against him, falsely claiming only four women had made allegations (more than a dozen did) and said they had been paid to do so (there has been no evidence to support that). "Well it does impact my opinion, and you know why? Because I've had a lot of false charges made against me. I'm a very famous person, unfortunately. I've been a famous person for a long time. But I've had a lot of false charges made against me, really false charges," Trump said. "I know friends that have had false charges. People want fame, they want money, they want whatever. So when I see it, I view it differently than somebody sitting home watching television where they say oh, Judge Kavanaugh this or that." By the end of the press conference, though, Trump had returned to a defense of Kavanaugh and didn't respond to a question about what kind of signal he was sending to young men by possibly dismissing Kavanaugh's behavior. Even if he nominated someone else, Trump claimed, they could be derailed by the same type of allegations. "This is beyond the Supreme Court. This has everything to do with our country," the president said. "When you are guilty until proven innocent, it's just not supposed to be that way." After Trump's remarks in New York on Wednesday, the Senate Judiciary Committee released transcripts that revealed the panel also questioned Kavanaugh about two other accusations that were previously unknown. In the transcripts, Kavanaugh denies the allegations, which were made anonymously and without corroboration. Thursday was already shaping up to be a split-screen day in addition to Kavanaugh's testimony, with the president also set to meet with Deputy Attorney General Rod Rosenstein and the possibility that Trump might fire the man who oversees the special counsel's Russia investigation. But Trump signaled that he was inclined to keep Rosenstein on board and may even delay that planned meeting. As he closed out his week at the U.N. General Assembly, Trump also disputed the fact that when he was addressing world leaders and top diplomats Tuesday, he had drawn laughter — when he boasted that he's accomplished more during his time in office than almost any previous administration. On Wednesday, Trump claimed that world leaders were laughing "with" him, instead of at him. "I didn't expect that reaction, but that's OK," he said at the time, pressing ahead undaunted.